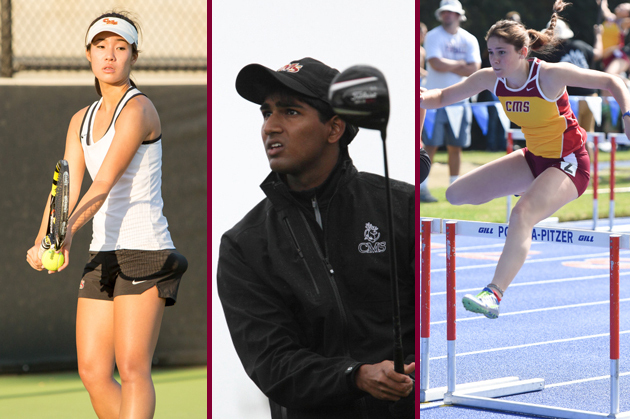 With the academic year winding down, so have the seasons for several sports teams with CMS Athletics and Claremont McKenna College. However, five CMS varsity sports (women’s tennis, men’s tennis, men’s track & field, women’s track & field and men’s golf), along with The Claremont Colleges men’s rugby team are still in action with postseason play in their respective sports. Find out more about each team and their postseason plans below. Men’s Golf This is the fourth-straight NCAA Division III postseason appearance for the Stags and ninth time overall. The 2015 NCAA Championships will be held May 12-15 at Grandover Resort in Greensboro, N.C. on the East and West courses. A total of 210 participants (five from CMS) from over 40 conferences will vie for the team and individual national championships. CMS is ranked No. 4 in the West Region and No. 9 overall heading into the NCAA Championships. More information can be found on the CMS Men’s Golf Webpage. Track & Field A total of eight Athenas and three Stags are expected to take place in the NCAA Division III Track & Field Championships from May 21-23 in Canton, N.Y. based on their qualifying marks and times from the regular competition season, which for CMS track & field athletes, ended on May 9 at the Occidental Invite. The NCAA officially announces participants for the NCAA Championships once final qualifying times and marks from other schools around the country have been recorded. Other teams and athletes have until Saturday, May 16 to qualify for nationals. More information about nationals will be posted on the CMS Track & Field webpage as soon as it becomes available. Women’s Tennis The CMS women’s tennis team competed in the first three rounds of the NCAA Division III Women’s Tennis Championships on May 8-9 at the Biszantz Family Tennis Center in Claremont. The Athenas had a bye in the first round and then went on to defeat Trinity (Texas) (5-0) and Pomona-Pitzer (5-0). With those wins, the Athenas have moved on to the quarterfinals of the championships. The Athenas will next play in Mason, Ohio, as they compete in the quarterfinals of the NCAA Championships on May 18, against Carnegie Mellon. More information on the final rounds of the NCAA Tennis Championships can be found here. Men’s Tennis The CMS men’s tennis team went 2-0 in the regional portion of the NCAA Division III Men’s Tennis Championships last week, with wins over UC Santa Cruz (5-0) and Pomona-Pitzer (5-0) at the Biszantz Family Tennis Center in Claremont. The Stags have now advanced to the quarterfinals of the NCAA Division III Championships, where they will play Johns Hopkins on May 18, in Mason Ohio. More information on the final rounds of the NCAA Tennis Championships can be found here. Men’s Rugby (Club) On April 18, the men’s rugby 7s team won a qualifying tournament and qualified for the National Small Colleges Rugby Organization (NSCRO) Penn Mutual Collegiate Rugby Championships in Philadelphia, Penn. This is the first time that Claremont has participated in the event which runs from May 30-31.